The sculptured white marble Celtic cross, which was funded by public subscription, commemorates Brigadier General Henry Finn who died in 1924. 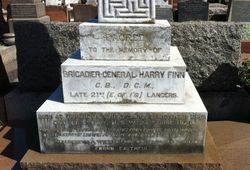 Henry Finn was a British soldier who in 1899 accepted the post of commandant of the Queensland Defence Force with the local rank of colonel. He arrived to take command on 11 April 1900. During his tenure in the post the Australian colonies were federated, and Finn was selected to preside over a Commonwealth Defence Pay Committee which met in Sydney in 1901 to consider rates of pay and allowances for the forces. Finn was soon offered the post of commandant in New South Wales with local rank of brigadier general, and began duty on 1 January 1902. In terms of seniority he was second-in-command of the Commonwealth Military Forces following the arrival in 1902 of another British officer, Major General Sir Edward Hutton. 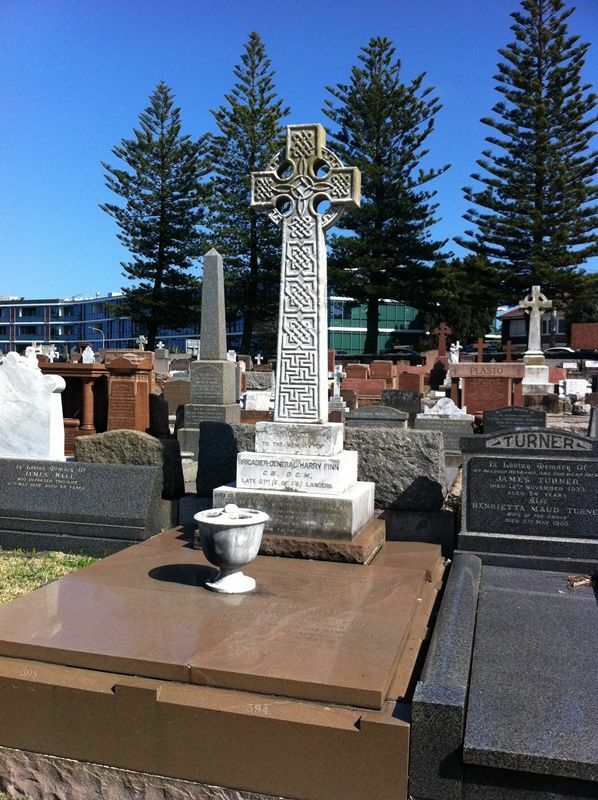 When he died in 1924, Finn was buried with full military honours in South Head cemetery. The funeral cortège was so large that it took two and half hours for the last mourners to arrive at the cemetery following the service at his Point Piper home. A meeting was held at the Royal Naval House yesterday afternoon for the purpose of inaugurating a movement having for its object the erection of a monument over the grave of the late Major-General Finn. Sir William Cullen, who presided, said that there was hardly any need to emphasise that the late Major-General Finn had rendered great service to Australia and the Empire. Not only was General Finn a distinguished soldier, but he was, too, a splendid citizen and a staunch friend. 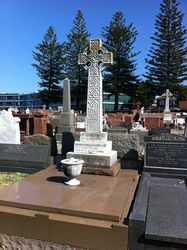 He moved the following motion:— "That in expressing profound sorrow in the loss sustained through the death of the late General Finn, this meeting desires to show its appreciation of the distinguished services he has rendered the Empire, and particularly Australia, by the erection of a monument to his memory on his grave at the South Head Cemetery, and that subscriptions be invited for that purpose and for the cost of interment, any surplus received to be handed the family." The State Commandant (Major-General Brand), in seconding the motion, said that they as soldiers and citizens desired to place on record for all time their appreciation of the late Major-General Finn, and establish something that would remind the present and future generations of his services to the Empire. General Finn was more than a distinguished soldier. He was the ideal citizen, a friend with a great heart, one of that type of British citizen who made the Empire what it was to-day. The motion was agreed to. Sydney Morning Herald (NSW), 4 July 1924. Late 21st (E. of I`s) Lancers. Born at Tenterden, Kent, England, 6th December 1852. Died at Sydney, N.S.W., 24th June 1924.